I hope you all are having a great day Summer is near and school is almost over! 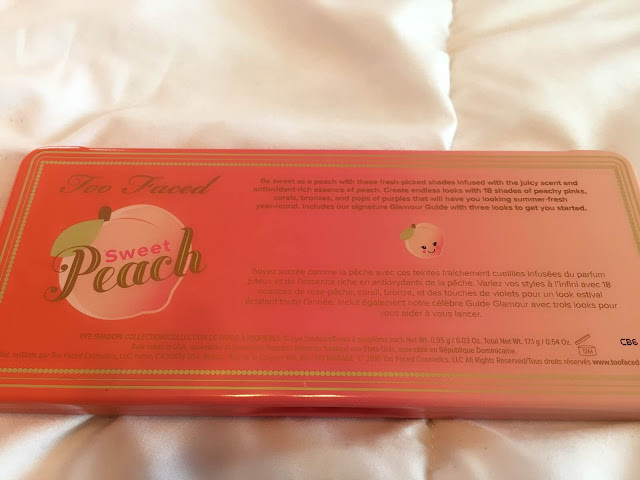 Anyway today I'm gonna review too faced: sweet peach palette that everyone is talking and raving about in the social media to the point that too faced announce that they will no longer restocking sweet peach. This palette is the sweet peach palette from Too Faced Cosmetics. It's their fourth palette collection to join Too Faced eye shadow product. Infused of their 18 shade of peachy pink, coral, bronzes, and pop of purples. The smell is AMAZING!!! Smell like peaches with bit of honey and it just pretty addictive. Thankfully I reserved my sweet peach palette about 2 or 3 weeks before their release on Sephora store because I've been looking for them everywhere and anywhere was already sold out so I recommend you to contact to your local Sephora, Ulta or any cosmetic store if they still have them. Since I'm not good at editing photo because I'm like Usagi Tsukino when it comes to computer but I bet she is way worst than I. Some of those eyeshadow need an eyeshadow primer to make the color pop more. That one of the first thing I noticed since I usually wear my eyeshadow primer I never noticed until I swatch them. I'm not disappointed over this palette it's quite beautiful I like their pigment, their smell it last quite a long (perhaps it's the primer I wear and the fixing makeup spray?) so far it's one of the best purchased hopefully Too Faced will make other palettes like their chocolate one (what if they make one of crepes?) either way it's totally worth the hype that even Jeffree Star & Nikkie tutorial are bragging about so get them before they're long gone.